Are you a constant sufferer of the dreaded 3pm energy slump? Us too, and it’s easy to see why: after scarfing down lunch at your desk and not getting up since, your energy is bound to be at its lowest. Instead of running to Starbucks for a caffeine pick-me-up, why not try a midday workout instead? Yeah, it sounds crazy, but it turns out that it could be the answer to many of our energy and fitness issues. “One of the biggest misconceptions people have when they don’t really work out is that you need a lot of energy [to start],” says David Schenk, the owner of Cross Train, a studio in Hollywood. “But working out gives you a huge boost of energy. It is equal, if not, better than coffee in the middle of the day.” Plus, caffeine only gives you a temporary energy boost, followed by an awful crash. Whereas if you sneak away during your lunch break and do a quick workout, the endorphins will keep you pepped up the rest of the day. But who has time for a full hour lunch break, you say? Think again. All you need is five minutes. “The keys to a successful afternoon workout is that it’s got to be short, it’s got to be simple, and you need to have a timer involved,” says Schenk. The timer not only keeps you on track (can’t miss that 3:30pm meeting! ), but it also keeps you accountable and you’re more likely to complete the workout. Schenk swears by tabata—a timer and fitness app that you can find in your app store. “It’s an interval training model, basically 20 seconds on, followed by 10 seconds of rest. 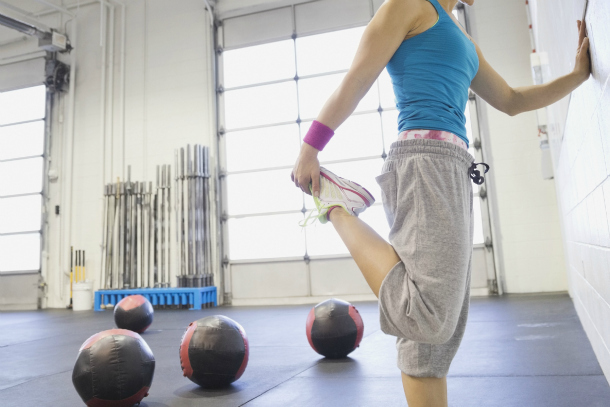 You do this eight times through for a total of 4 minutes.” And that’s your whole workout! The one downside: the more effort, the most you’ll sweat. If you don’t have time to shower, stock dry shampoo and anti-frizz serum in your gym bag. Our favorite post-workout picks are Klorane Dry Shampoo with Oat Milk ($20) and Living Proof Satin Hair Serum ($29). Focus the dry shampoo at the roots and the back of the neck, using the serum along the strands as needed to tame flyaways. As for the body, use Savvy Traveler Facial Cleansing Wipes ($19.99) wherever the skin is excessively damp and finish with their Antiperspirant Wipes before changing back into office attire. If it’s more about perking up than squeezing in your workout for the day, do something as simple as going for a walk. “Walking doesn’t burn a lot of calories, so it’s kind of looked down upon. But it’s great to just regulate the body, relax and help you breathe better.” Three things coffee could never claim to do.